Golden State Warriors head coach Steve Kerr runs some incredible action as well as establishing an amazing motion offense. A big part of these sets and motion that allows them to work is the initial action before each set – primarily motion strong. Motion Strong is a set that the Spurs and Pop made famous and is now run by almost every team at every level. Now we have established the base – the motion strong part – we will look how it flows into Horns. 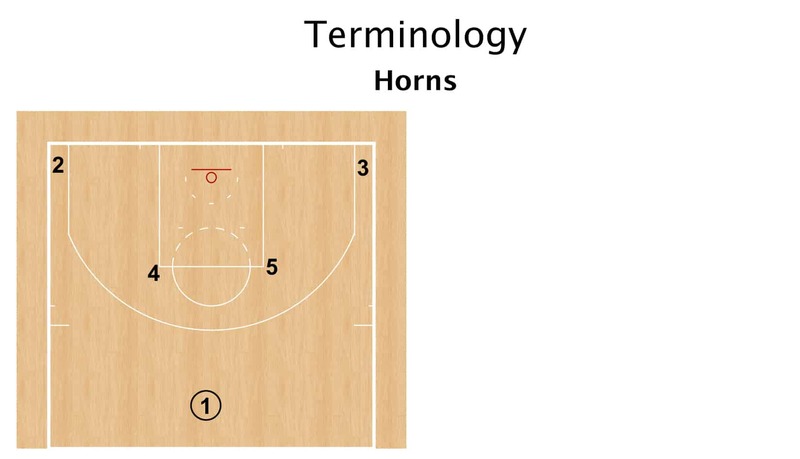 Horns formation is the ball in the middle of the floor, two players – typically both bigs – at the elbows and two players – usually guards – in the corners. The basic idea of this play is utilizing a counter out of their basic motion action to get a backdoor with weakside action. I love plays that involve a main action and have weakside movement or action to force the defense to guard every spot on the floor. Obviously this is magnified with the Golden State Warriors personnel and the fact they have 3 of the most lethal scorers in the NBA today, but I think the concept at the high school level can work. After the point guard passes to the big who is trailing, the big flips is back and both bigs sprint to the elbows. The point guard then hits the elbow and cuts opposite with the other big – forming a stagger. The big at the elbow then turns and dribbles at the guard in the corner – usually Kevin Durant – who would setup his cut and go backdoor. If the guard cutting backdoor is covered then the weakside stagger for Klay Thompson would be the next look. The ability to run a shooter off a stagger screen with backdoor action combined with these skilled players and it is a great play.